Here are 7 simple secrets to making your drive a success. Tell the world what you’re going to do with the donations, how they will help. People like to be a part of something, and they hear “donate” all day long. Give them a reason they can’t deny to donate to your drive. It doesn’t have to be extensive, just a quick why. Not everyone reads as closely as we would always like, so give them something they can't look away from. The image you pick will also become the face of your drive as it is the image that YouGiveGoods displays on the Explore page, the "Share This" email, and anytime someone uses your social media buttons. Comment or post updates throughout your drive. Others will do the same once they see you doing it. The more updated your page looks, the more people will want to be a part of it. Emails can be as involved as you want them to be. At their easiest, go to your drive page and click the "share this" located under your goal information. Just add in your list of emails (without spaces), and hit submit. You're done! Tell your supporters about yourself and your team. Why you’re doing this, why you love this particular charity. It’s simply human nature to support things that are “real”. Have fun with this! It is fun, we’re raising goods to help our communities. If there’s something you want to try, but don’t know how — contact us. We’ll be happy to help you figure it out. Did you even wonder what happens once your drive finishes? Is there another person that takes over or is it all automated? The answer is one very hardworking team member handles the coordination of every drive's goods delivery. Introducing YouGiveGoods' Operations Manager, Laurie Strumpf. Laurie is well-known among our partner nonprofits: getting a call from her means a delivery is coming! She is the Goods Fairy. End a drive, and she leaves a pallet on their door step. Of course, it's not so straightforward. There are many parties she needs to coordinate with: the Team Captain, the Nonprofit, and even those actually delivering the goods. (We haven't yet figured out Santa's trick for delivering toys throughout the world in one night, but I believe Laurie is actually working on cracking that as well) In the end, though, she ensures every item has reached its destination and ready to help the community. What made you interested in working at YGG? I was intrigued by YGG's unique model and thought it was a great idea and opportunity. I wanted to be a part of doing good for others in an innovative way. How long after a drive ends does it usually take for the nonprofit to receive their goods? We set the expectations of 15 business days to receive the donations to their doorstep however, I always try to exceed that expectation if possible. We also try to coordinate with times they have volunteers on hand or if they need the items for a special occasion or event. What is the process once a drive ends? I contact the designated charity to confirm their address, delivery instructions and to schedule delivery. I then work with our vendors to get the donations ordered and shipped. Once I have an expected delivery date I confirm via email the delivery date with the charity and copy the Team Captain letting the charity know who to credit for the drive. As I receive tracking information I forward it to my contact at the charity so they know exactly when the donations will arrive to their doorstep. #GivingTuesday, December 2, 2014, is such an exciting time of the year! It's our chance to give back; to give our communities a little love and attention. To look around us and see how we can help others with the challenges they face in life. If there's any drawback to the day, it's the overwhelming number of fundraising ideas, tips and tricks. There's no one way to "succeed" on that day — there are millions. For a little something different, we offer you the YouGiveGoods #GivingTuesday Campaign. Stand out and raise some items for your community! Your goods drive could be the focus of your event, or a supplementary addition to whatever else you have planned. Host one drive, or several. Compete with your friends in a challenge, or work together as a team. Our #GivingTuesday Campaign has officially launched! You can learn more on our campaign page or get started with your own #GivingTuesday drive right here. From November 24th to December 31st, the YouGiveGoods #GivingTuesday Campaign brings together a collection of virtual food, supply and toy drives under one goal: giving back to our nation's charities during the holiday season. Individual drives are started by schools, companies, nonprofits, shelters and volunteers, to raise goods for favorite charities. The combined raised shows support for giving back, nationwide! New Goods Arrival: The Toys Are Here! Our toys have arrived! They're JUST in time for the upcoming holiday drive season. Every once in awhile, we refresh our goods selection to reflect the evolving needs of charities across the country... and it looks like a happy assortment of playsets, action figures, dolls, games and more, are on quite a few wishlists this year. I took part in a #GivingTuesday webinar today. As you can imagine, it was so much fun, and all the panelists were so wonderful, that I had to share it with you. For my bit I spend time discussing how when you should tailor your #GivingTuesday incentive program to what goals you want to get across. I also dropped what this year's YouGiveGoods program will be. Hint: it's very different that other years! Do feel free to reach out to me if you have any questions. Not every food drive is about the quantity of products it offers. Sometimes, the community impact is just as substantial by offering just one: for example, peanut butter. That may be oddly specific, but that’s because I have a drive in mind: the Patrick Byrne Peanut Butter Global Nutrition drive (PB2). Patrick Byrne passed away in 2010, and left behind a legacy of love for the community and peanut butter. PB2 asks students from several high schools to donate peanut butter to orphanages in the Dominican Republic and Haiti. Items are donated online, delivered to the partner organization, Foundation for Peace, and then shipped abroad. The movement may have started with Patrick’s love of peanut butter, but there are very practical reasons why peanut butter is used for international relief. Peanut Butter contains protein, sugar, fat and several vitamins and minerals; all needed for individuals suffering from severe malnutrition. In 2013 the National Post stated malnutrition was “ravaging” Haiti’s children; and the numbers of children affected were unfathomable. The Byrne family and those who support the campaign may be helping up to 15% of all children in the Dominican Republic and Haiti. Yes, up to 15% of all children in these locations are currently living in orphanages. The impact is clearly substantial. This year's drive will be led by teams in two New Jersey high schools: Morristown High School (Thomas Byrne and Brenden Rochelle) and Delbarton High School (Teddy Vermylen) as well as one in Massachusetts: East Longmeadow High School (Emily Rodgers). 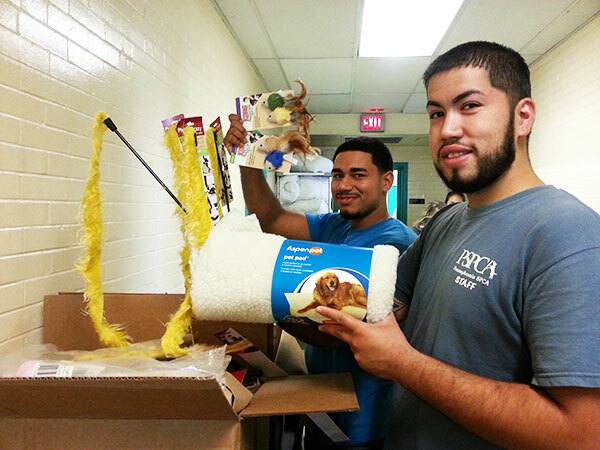 Looks like the first shipment of donated pet goods landed safely at their new home in Pennsylvania Society for the Prevention of Cruelty to Animals (SPCA)! In August this year, nearly $5,000 was raised in their honor by Verizon Wireless for NEATropolis Charity Event 2014. Translated to the goods we shipped out? That's: 33 washable fleece blankets, 41 boxes of wands and mice, 41 boxes of kongs and rope toys, 40 bags each of Hill's Science Sensitive Stomach food for cats and dogs, 720 cans of Hill's Science Diet cat food, and 360 cans of Hill's Science Diet dog food. We want to wish a congratulations to The Campus Kitchens Project for just having launched their 39th Campus Kitchen at Saint Peter's University (located in Jersey City, NJ)! In late August, Campus Kitchens ran a drive with us for a few weeks, raising around $1,500 in additional food to subsidize their new kitchen, and to ensure that each meal going out to the community is full, healthy, and balanced. Check out their drive here.